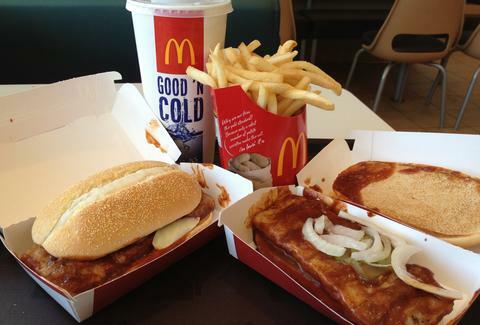 Ever since it became a limited-time menu item in 2005, the McRib has been on the nation’s collective mind. “When will it return to us?”, many have cried out, longing for its saucy, porky goodness. Well, it’s finally back again, folks -- but not for everyone, so don't whip out your bib just yet. McDonald’s is rolling it out regionally, but they’re keeping pretty mum about where exactly the boneless wonder is headed (it’s up to the individual stores to decide whether to stock it). You can, of course, stay up-to-date on where it’s been sighted on the McRib Locator website -- if that’s your speed. And, in anticipation of its return to your ‘hood, we’ve rounded up the best McRib commercials from the ‘80s and ‘90s so that you can relive your favorite seasonal fast-food sandwich’s glory days all over again. This dude was skeptical at first, but when a reassuring disembodied voice explains to you what a great taste experience you’re in for, you go for it. America was glad he did. The McRib once inspired an entire gospel choir to sing its praises. Its anti-bone agenda was never spelled out more explicitly, or with more panache. People like this make the McRib Locator necessary. Nobody can forget the moment in 1990 when the nation had to be re-educated on what constituted a McRib. Fortunately, we had their succinct descriptions of “saucy”, “sassy”, “spicy”, and “ahhhhh” to help us piece it together again. This guy is a bit bummed about summer being over. But he’s cool, so you totally feel for him. Then McDonald’s gives him a McRib, and everything is right with the world. Kinda reminds you of something you wish would happen now, huh? Adam Lapetina is a Food/Drink staff writer for Thrillist, and hasn't yet located a McRib. Read his musings at @adamlapetina.